Bringing you exciting news using my unregistered assault keyboard from a hidden location. Fundamentalist evolutionists are going to go haywire again when their dogmas and presuppositions are exposed. "What ineffable twaddle!" I cried, slapping the magazine down on the table, "I never read such rubbish in my life." "What is it?" asked Sherlock Holmes. "Why, this article," I said, pointing at it with my egg spoon as I sat down to my breakfast. "I see that you have read it since you have marked it. I don't deny that it is smartly written. It irritates me though. It is evidently the theory of some arm-chair lounger who evolves all these neat little paradoxes in the seclusion of his own study. It is not practical. I should like to see him clapped down in a third class carriage on the Underground, and asked to give the trades of all his fellow-travelers. I would lay a thousand to one against him." "You would lose your money," Sherlock Holmes remarked calmly. "As for the article I wrote it myself." Are you familiar with the mostly-vanished phrases "horse feathers" or "hogwash" as expressions that something is nonsense? Not as colorful as Dr. Watson's expression just above, but saying "dinosaur feathers" may be a fun alternative. They seem to love trying to say that dinosaurs evolved into birds, even though the evidence is against them: dinosaurs ate birds, and modern birds are found in the same rock strata as dinosaurs. Also, not all evolutionary scientists are united in the dinos-to-birds concept. The sultans of spin are so locked into their paradigms that they simply go around the evidence because they "know" what they believe is true. 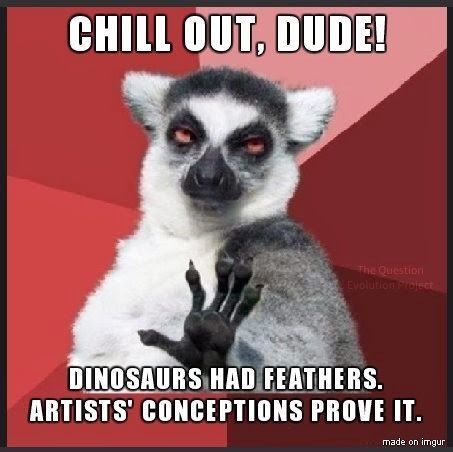 They are constantly seeing things that are not there, such as feathers on dinosaurs, or believing prehistoric birds (which have feathers and all the mechanisms of real birds) to be dinosaurs. The ever-loyal press love to publicize anything sensational. Here are two articles about the wishful thinking of evolutionists to make something into what it isn't. We’ve reported “imaginary feathers” on dinosaurs over the years, but this new fossil bird could fly. You can finish reading the first article by clicking on "Real Feathers Found on Imaginary Dinosaur". Then come back for the next one. Biological aerodynamic engineering was in high gear long before modern birds evolved, evolutionists believe, based on analysis of some really long tail plumage. A fossilized, high-performance, feathered microraptorine called Changyuraptor yangi is making headlines as the longest-feathered “feathered dinosaur” on record. It had “four wings” (sort of) and a long tail featuring a sleek, aerodynamic design and quill-like feathers about a foot long. Counting the tail, Changyuraptor was about four feet long and weighed around nine pounds. You can finish reading by clicking on "“Feathered Dinosaur” Featured Long Tail Plumage, Evolutionists Say". I wish I could get paid government grant money for indulging in my imagination. Don't you? At any rate, the evidence is clear that birds and dinosaurs were created separately, and one did not evolve into the other. These scientists are driven by ideology, not a search for real knowledge. If you want to keep going, click on "Dinosaur Feathers Part 2 — What a Stupid Concept".